Bangladesh Tariff Commission Chairman has praised country’s electronic manufacturing company Walton’s factory for its cutting-edge technologies and machineries. “Walton factory, in a word, excellent. The local brand is manufacturing various sorts of high-tech products like refrigerator, air conditioner, television and other home and electrical appliances with its cutting-edge technologies and machineries. I’m very much proud as a customer as well,” said Mushfeka Ikfat, Tariff Commission Chairman. She expressed her delighted remarks after visiting Walton factory at Chandra in Gazipur on Sunday (March 12). Tariff Commission Member Abdul Quaiyum, Joint-Chief Sheikh Liakot Ali, Deputy Chief and Personal Secretary to the Chairman Mohammad Nazrul Islam and actor Mir Sabbir were accompanied her. Managing Director to Walton Hi-Tech Industries Ltd. SM Ashraful Alam welcomed the Tariff Commission Chairman and her entourages with bouquets after their arrival at Walton Hi-Tech & Micro-Tech Industries premises. Executive Directors of Walton Group Abul Bashar Howlader, Md. Sirajul Islam and Ashraful Ambia, Senior Operative Director Uday Hakim and Operative Director Engineer Golam Murshed were among other top Walton officials present on the occasion. Mentioning that, the Tariff Commission is to protect local companies, Mushfeka Ikfat assured of providing all kinds of supports to Walton to carry out its initiatives for the expansion of local technological products manufacturing sector. The Senior Secretary of the Ministry of Commerce said, we couldn’t imagine from outside that Walton has so nice and self-sufficient production unit here. Visiting the factory, I witnessed that all kinds of parts are manufactured here. Walton is now self-reliant in manufacturing refrigerator. For which the economy of the country is getting strong while the consumers are getting quality products and services as well. Manufacturing compressors in the country is not only a great success for Walton, but also for Bangladesh, she added. Expressing his reaction of the visit, actor Mir Sabbir said, visiting Walton factory, I feel very proud. I have witnessed more than my expectations. Beside, manufacturing quality products, Walton has created employment scopes for many people. I am taking wonderful experiences with me from here. The Tariff Commission Chairman visited the Walton factory complex to witness the growth of the electrical and electronics products manufacturing sector in the country and the work environment of the factory. Prior to the visit, she and her entourages enjoyed a corporate documentary on Walton. They then visited the well-decorated product display centre of Walton. 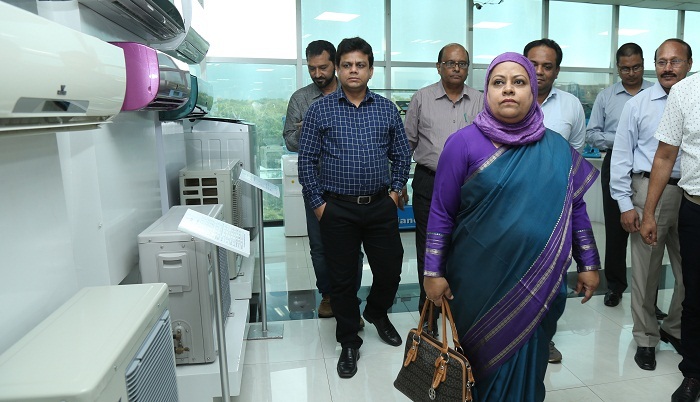 Later, they visited various production units of Walton Hi-Tech and Micro-Tech Industries Ltd. including refrigerator, air conditioner, LED televisions, home appliances etc.